A beginners cool and easy project. Snowflake coffee table set. Made these last December for a friend as a gift . Here I used 3ply cotton thread ..so no need to block it . The bud like feature in finishing round helps to retain the shape perfectly. Rnd 2 - 5ch (counts as 1dc 2ch), * 1dc , 2ch * repeat * * 10 times , sl st in 3rd ch beg 5ch . Rnd 3 - 1 sl st get in to next sp , sc in same sp * 4ch ,3tr in next sp ,4ch ,sc in next sp* repeat * * 5 more times , sl st in beg sc . Rnd 4 - sl st in each next 4ch , 1ch, * sc in each next 3sts, 10ch* repeat * * 5 more times , sl st in beg 1ch. Rnd 5 - 3ch (counts as dc) *7dc ,2ch ,7dc in next sp* , repeat * * 4 more times , 7dc ,2ch ,6dc in next sp , sl st in 3rd ch of beg 3ch . Rnd 6 - sl st in each next 3 sts ,3ch(counts as a dc) , dc in each next 3 sts , shell in next sp , dc in each next 4 sts ,*10ch , skip next 6dc , dc in next 4 sts , shell in next sp , dc in each next 4 sts* repeat * * 4 more times , sl st in 3rd ch of beg 3ch . Rnd 8 - sl st in each next 3 sts , 3ch , dc in next st , shell in next sp , dc in next 2 sts , skip 4 sts , *dc in each next 4 sts , shell in next sp , dc in each next 4 sts , skip 4 sts , dc in each next 2 sts , shell in next sp , dc in next 2sts , repeat * * till end ,sl st in 3rd ch of beg 3ch . 1ch ,1sc in same sp (* 3ch ,sc in previous rnd sp just below working rnd [enter hook from front] ,3ch ,1sc in working rnd * sc in each next 4 sts ,sc, 3ch, sc in next sp, sc in next 4sts, do * * , sc in each next 6 sts ,sc , 3ch ,sc in next sp , sc in each next 6 sts ) repeat ( ) till end , sl st in 3rd ch of beg 3ch. See pics. 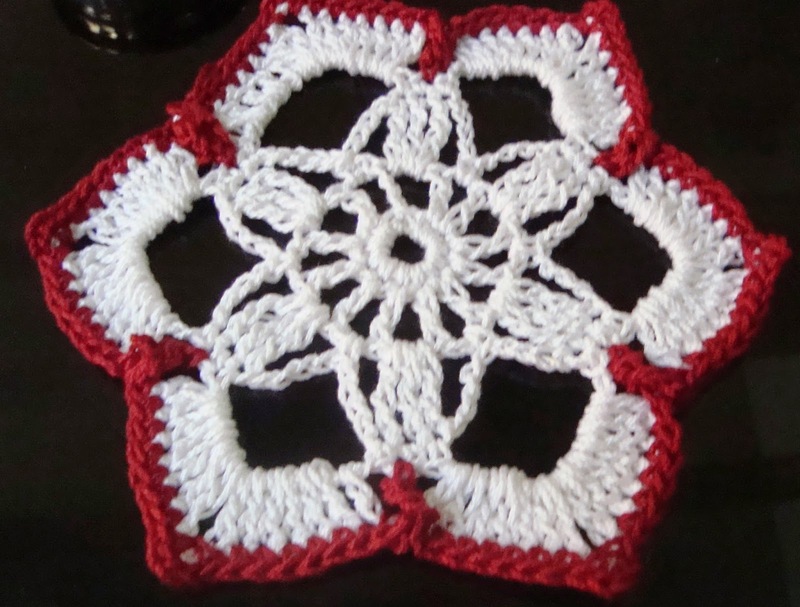 For Coasters - Same as doily pattern up to Rnd 5 . Finishing Rnd - Same as for doily just omit the small petals. Hope you enjoyed this project. For any query or information about the pattern contact me on rose.crochet68@gmail.com or in comment section. I love to here from you.